I used to think baby wipes were a great invention. If you've ever changed a baby's pooy bum, you love baby wipes. But I think they could be creating an OCD generation! As a photographer, I love nothing more than leaving my kids, the smaller the better, with mucky food and waiting for the photo opportunity to develop. The other day was a wonderful example. 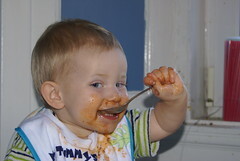 I left the dining room to answer the phone leaving Marcel, Lots and Pudge eating Heinz tomato soup. Unknown to me Marcel and Lots finished and left Pudge alone. I returned to the dining room where Léon had dipped both his hands in the soup and was gleefully squelching the soup between his pudgy fingers. I remained hidden. He then did two handprints on the wooden table and started covering the table in soup from end to end squealing in excitement. I appeared in the doorway, Léon jumped in fright, knowing that he'd made a huge mess. He held his arms outstretched and said I think I need to give you a sorry hug! Sweeeeeeeeet! I wasn't mad with him - I'd watched a simple joy of childhood - the discovery of texture - messy play. Kids are meant to be dirty. :-) They aren't meant to be wiped between every mouthful of yogurt in case their clothes get soiled. In this day and age with washing machines and tumble dryers it is not hassle to wash dirty clothes so why tell a kid it isn't meant to get dirty? They learn through investigating. Just watch Léon in our vegetable patch discovering how potatoes grow, where worms live etc. I hear kids in the summer saying 'I'm not allowed to get wet'. Why the hell not? - childhood is about getting wet with water pistols, playing in the mud. It's adults putting their own adult hang-ups onto their kids. By wiping the babies from birth we are subliminally telling them being dirty is bad, so getting dirty starts to freak them out. 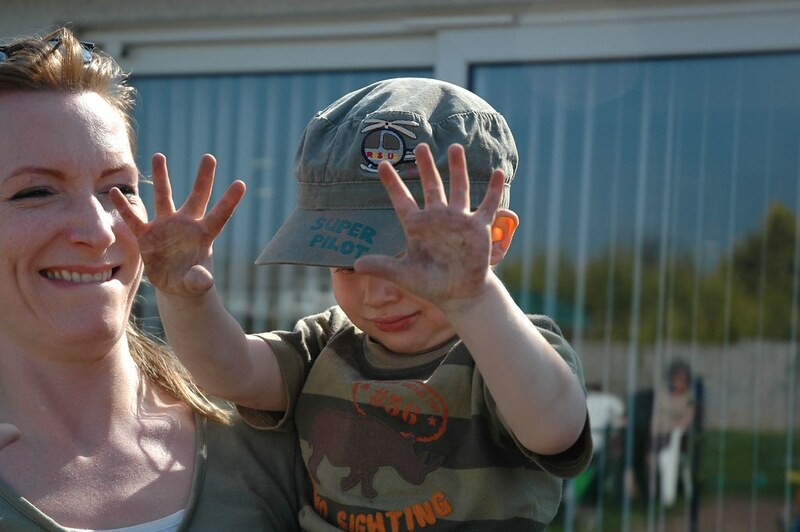 We are the ones making the kids hate being dirty, they aren't naturally against dirt. OMG, WHAT'S SHE DONE NOW???? IS IT THE WIDMANN GENES?